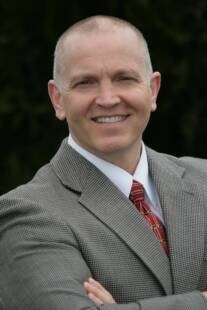 “I woke up yesterday morning with severe neck pain that radiates down my right arm to my hand and I can barely move my neck without producing the shooting arm pain.” Or, “...for the last few months, I’ve had this nagging pain in my neck and when I look up, my arm goes numb.” Or, “Every time I bend my head to the left, my left arm goes numb. I’ve noticed when I lift weights, I can only curl 15 lbs with my left arm compared to 35 lbs with the right.” These are common histories describing a classic “pinched nerve in the neck.” So, what is a “pinched nerve?” To answer this, let’s first look at what a “nerve” is. 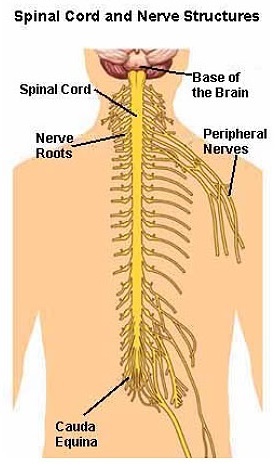 In the diagram above, the nerves come off the spinal cord. Those in the neck region go down the arm and those in the low back go down the legs. The spinal cord is the “highway” that brings information from the nerves in the arms, legs, trunk, etc., to the brain where information is processed. The bony spine houses and protects the spinal cord and skull protects the brain but there is no bony protection for the nerves. 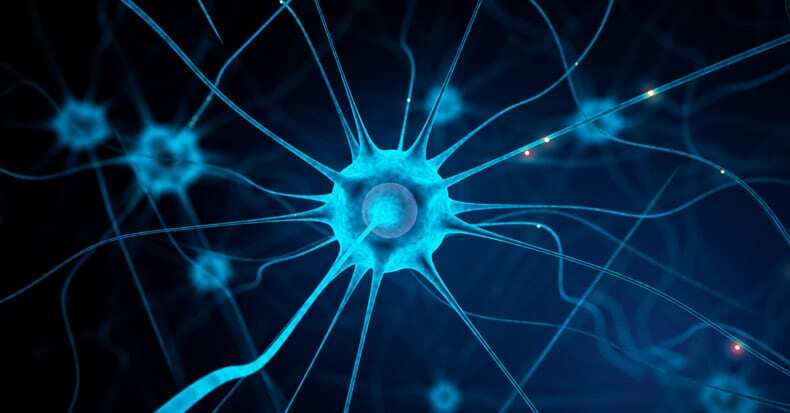 Nerves bring information to the brain allowing us to feel, taste, smell, see, and move our legs and arms to perform complex movements like dancing, running, gymnastics, and so on. Information is constantly going to and from the brain to allow us to function normally. The nerve can get “pinched” anywhere along its course, including the wrist (carpal tunnel syndrome), elbow (cubital tunnel syndrome), shoulder (thoracic outlet syndrome), and/or neck (herniated disk and/or arthritis). This results in a slowing down of information transmission to/from the brain and numbness, pain, throbbing, as well as weakness in strength can occur. 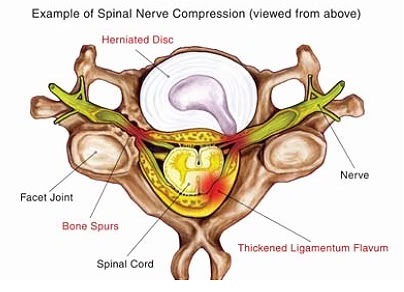 The nerves exit the spine through holes that can be narrowed if the jelly central part of the disk herniates outward and into the nerve pushing it against the bone that makes up the hole through which it exits the spine. A “bone spur” (as shown in the diagram to the left, coming off the left facet joint) pushing into the nerve or the thickening of the ligaments that run inside the spinal canal (eg., ligamentum flavum) can also crowd these sensitive nerve structures and cause similar symptoms. Both of these conditions are commonly treated by chiropractors.